Common vocabularies, data standards, application profiles and ontologies - seen as agreed “world views” for interoperability - are key in ensuring we can make better meaning, management and, ultimately, use of the vast amounts of data becoming available every day. In the first version of the TECHNICAL REPORT entitled 'Agri-food Data Standards: a Gap Exploration' (by Pesce, Kayumbi, Tennison, Mey, Zervas, 2018) the contributors limited temselves to the usability and openness criteria, which can be more objectively evaluated by open data experts. In the end, these criteria correspond to the ‘aspects of standards that are crucial for both their own interoperability and the interoperability of the data that can benefit from the standard (which means also ease of use by data and service managers)’. Since the domains of food and agriculture span across several disciplines (including plant sciences, farming systems, natural resources management, fisheries, all disciplines involved in the food supply chain) but are also closely interlinked with neighbouring disciplines (such as climate, environment, geospatial, biology), Agrisemantics map of data standards aims at including standards covering all of these disciplines. The 'Agri-food Data Standards: a Gap Exploration' report states that the agri-food domain is best represented by standards representing plant sciences: the reason for this is that the AgroPortal is specialised in that domain and the 46 ontologies managed in that portal and imported into the VEST/AGROPORTAL online map (Agrisemantics map of data standards) account for a good percentage of the vocabularies covered. 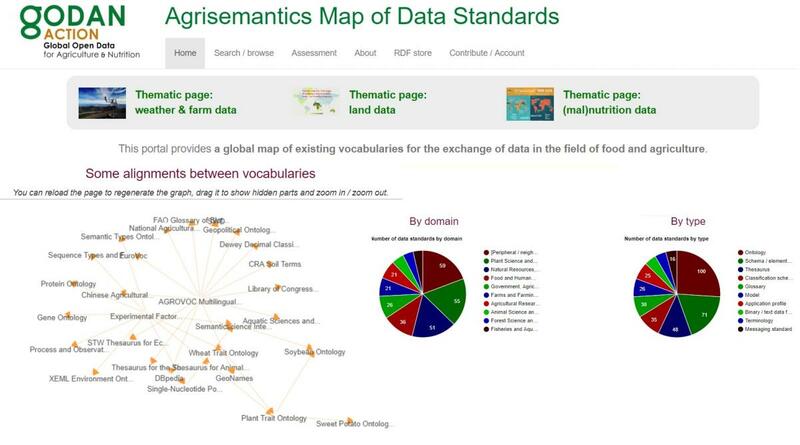 By accessing this map, you will be able to discover up to 400 existing data standards/vocabularies for the exchange of data in the field of food and agriculture. The VEST/AgroPortal online map of standards is a deliverable of the GODAN Action project that supports data users, producers and intermediaries to effectively engage with open data and maximise its potential for impact in the agriculture and nutrition sectors. In particular, GODAN Action works to strengthen capacity, to promote common standards and best practices and to improve how we measure impact in agri-food sector. Asking question about data standards covering the agri-food sector through Data Publication Online Helpdesk. Achievements, impact and strategy for AGROVOC's future. AGROVOC is a controlled vocabulary covering all areas of interest of the Food and Agriculture Organization (FAO) of the United Nations, including food, nutrition, agriculture, fisheries, forestry, environment etc.